A&D’s new FS/i series washdown scales are ip65 rated stainless steel platform scales offering triple range resolutions. 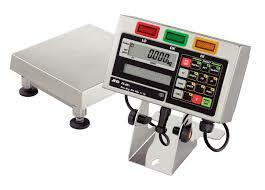 These bench scales are NSF certified and come with a tilting display head and digital keypad. Supported weighing units include lb, g, kg, lb-oz, and oz. Versatile A&D washdown scales are heavy duty bench scales ideal for warehouses, factories, or production settings. Easy to Use, Rugged, Waterproof, Stainless Steel Checkweighers with Analog Sweep LCD Display, Digital Keypad, and Setpoint Memory Recall for Quick, Accurate, and Reliable Measuring. The AND Weighing FS-i Series Checkweighing Scales have three resolution levels with large bright comparator lights.